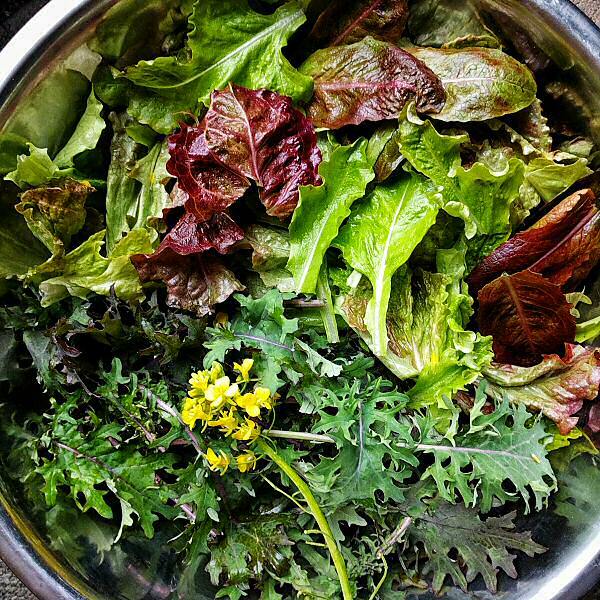 This bowl of lettuces and kale is the first cut of spring, taken from the unheated greenhouse while snow flurries whip around outside. With the help of 6 mils of plastic and some row cover, the salad easily survived three months of winter, with temperatures that went down to -30°C (-22°F). The texture and color are good, the taste, deliciously bold. Fantastic! The flowers are bok choi that managed to bolt in the alternating warmth and cold—on sunny days, the hoophouse temperature could easily reach 10-15°C (50-59°F), even when it was sub-zero outside. Interesting! I just began my gardening journey and having stumbled upon your site (through bloglovin’) has me even more excited to see my garden’s progress! What a bountiful and beautiful harvest!